The gripping true story of how three men used espionage, betrayal, and sexual deception to help win the American Revolution. Unlikely Allies is the story of three remarkable historical figures. Silas Deane was a Connecticut merchant and delegate to the Continental Congress as the American colonies struggled to break with England. Caron de Beaumarchais was a successful playwright who wrote The Barber of Seville and The Marriage of Figaro. And the flamboyant and mysterious Chevalier d?Eon ?officer, diplomat, and sometime spy?was the talk of London and Paris. Is the Chevalier a man or a woman? When Deane is sent to France to convince the French government to support the revolutionary cause, he enlists the help of Beaumarchais. Together, they successfully smuggle weapons, ammunition, and supplies to New England just in time for the crucial Battle of Saratoga, which turned the tide of the American Revolution. And the catalyst for Louis XVI?s support of the Americans against England was the Chevalier d?Eon, whose decision to declare herself a woman helped to lead to the Franco-American alliance. These three people spin a fascinating web of political intrigue and international politics that stretches across oceans as they ricochet from Versailles to Georgian London to the Pennsylvania State House (now Independence Hall) in Philadelphia. Each man has his own reasons for wanting to see America triumph over the British, and each contends daily with the certainty that no one is what they seem. The line between friends and enemies is blurred, spies lurk in every corner, and the only way to survive is to trust no one. 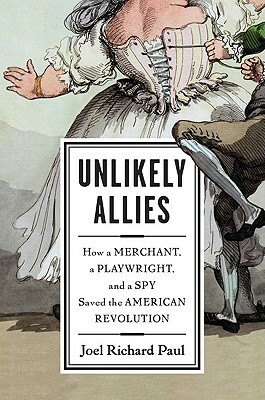 An edge-of-your-seat story full of fascinating characters and lavish with period detail and sense of place, Unlikely Allies is Revolutionary history in all of its juicy, lurid glory. Joel Richard Paul studied at Amherst College, the London School of Economics, Harvard Law School, and the Fletcher School of Law and Diplomacy. He currently teaches international economic law, foreign relations, and constitutional law at the University of California Hastings Law School, where he is also the Associate Dean.Previously, he taught at the University of Connecticut, Yale University, Leiden University in the Netherlands, and the American University in Washington. He has also practiced law with an international firm.Paul writes about international trade, globalization, regulatory competition, private international law, and the president's foreign relations powers. He is currently writing a history of U.S. foreign relations and international law.